Testimonial footage and images of artists used with permission. Public Domain Recordings courtesy of musopen.com. Videography and Editing by David Bazemore. The Community Arts Association was one of the agencies most responsible for Santa Barbara’s recognition of the beauty of its old adobes and before the earthquake used adobes as its branch headquarters. 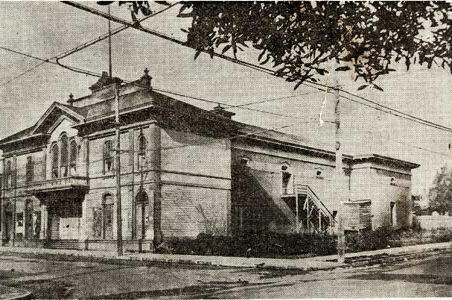 It dreamed of restoring the adobe, frame and brick theater (shown above), built by José Lobero on the corner of Anacapa and Canon Perdido Streets, but when this was found architecturally inadvisable, erected the handsome new Lobero Theater on the site of the old. The following year the earthquake came and the theater still stood, proving the wisdom of the decision. Sunday articles tracing the development and growth of the Community Arts Association, which was largely responsible for Santa Barbara’s “Golden Age” from about 1920 to 1930.